1. Preheat oven to 375°F. Heat oil in large saucepan set over medium-high heat; sauté shallots and garlic for 2 to 3 minutes or until fragrant. Add wine; cook for 2 to 3 minutes or until reduced by half. 2.Add cream, broth, sage, mustard, salt and pepper; bring to simmer. Cook for about 5 minutes or until slightly thickened. Remove from heat and stir in half of the Parmesan, and Cheddar cheese. Set aside. 3.Place piece of sweet potato into spiralizer chute. Turn spiralizer on; press sweet potato using pusher until dispensed into bowl. Repeat with remaining sweet potato and Yukon Gold potatoes. Using scissors, trim into shorter strands. 4.Toss potatoes with sauce and transfer to greased oval gratin dish or 8-cup casserole dish. 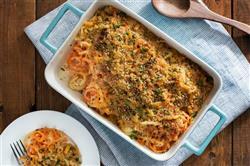 Toss bread crumbs with remaining Parmesan cheese, melted butter and parsley. Set aside. 5.Cover dish with foil. Bake for 40 minutes; uncover and sprinkle with reserved bread crumb mixture. Bake for 30 to 40 minutes or until potatoes are tender and bread crumbs are golden. Let stand for 10 minutes before serving.